Parsley is a common culinary herb, and has many medicinal properties. It contains many vitamins, including several B vitamins, calcium, and iron, and boasts more Vitamin C per volume than an orange. Parsley is a urinary tonic, used to help increase the flow of urine. Diuretics are used to treat water retention, congested lymph nodes, and urinary infections, and through this action, parsley helps promote the proper functioning of the kidneys and urinary system. 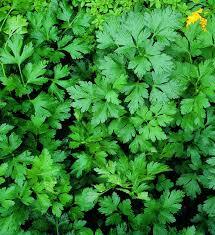 Additionally, parsley is a biliary tonic, aiding in the digestive process by helping stimulate the flow of bile. Parsley leaf is used primarily in cooking, and it also makes an excellent tea. Finely chop the nuts, Parmesan cheese, garlic and parsley and combine all ingredients together in a bowl. Add a pinch of salt and fresh ground black pepper. Pour olive oil over the mixture, stirring continually, until you reach a consistency that you like. You may want to add more or less oil depending on how you will use the sauce. Here’s a lentils with salsa verde recipe from Brittany Nickerson of Thyme Herbal accompanied by some additional information on parsley. And of course as the song tells us parsley, sage, rosemary and thyme are a favorite combination…for winter health. Learn more about each of the herbs and how to use them here. Cautions/Contraindications: Take caution when using parsley during pregnancy. As a member of the carrot family parsley it stimulates uterine contractions, though mildly.